Charging the Earth - Solar! : Higgs Boson found? 4 July 2012: As i am writing this, I am watching the live broadcast from CERN of the Higgs Boson discovery.... Is it just a blip in millions of pieces of data, or is it a brief flash of a pixel on a screen? It's still a bit of a mystery as to how they know they have found it, but hopefully the Guardian or another publication will finally explain it! 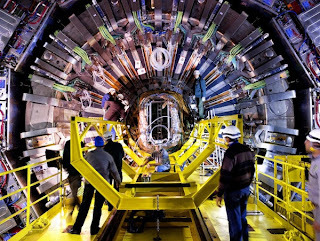 If this 'god-particle' finally proves that god doesn't exist, that will be interesting! (Google for 'Cern webcast' to find the page). At this time, we just have to 'believe' them.